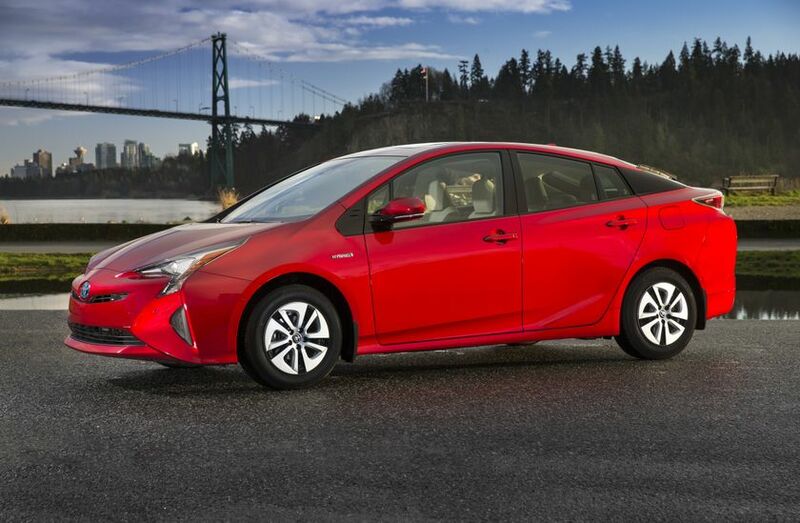 (TORONTO, ON – February 2, 2016) Usher in a bold new era of advanced motoring with the all-new, 2016 Toyota Prius – the fourth-generation of the world’s most popular and proven hybrid automobile. 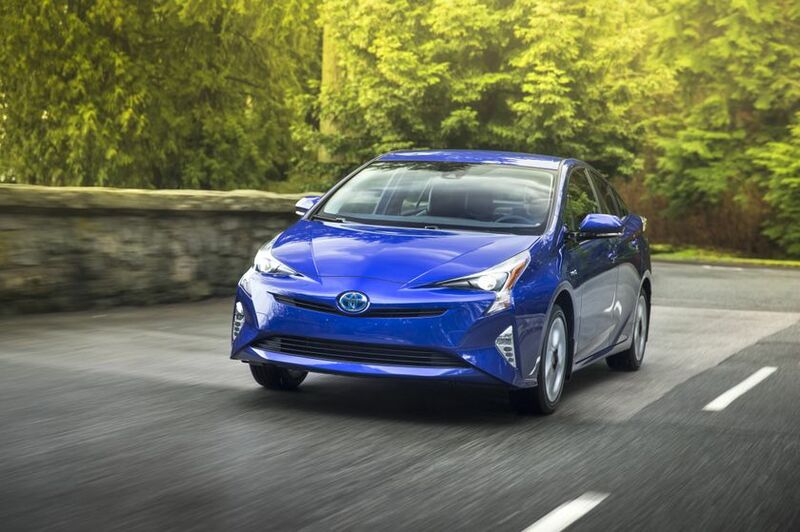 As in the third-generation Prius, Hybrid Synergy Drive combines the output of a 1.8-litre 4-cylinder gasoline engine and two motor/generators through an electronically-controlled planetary-type continuously variable transmission (CVT). 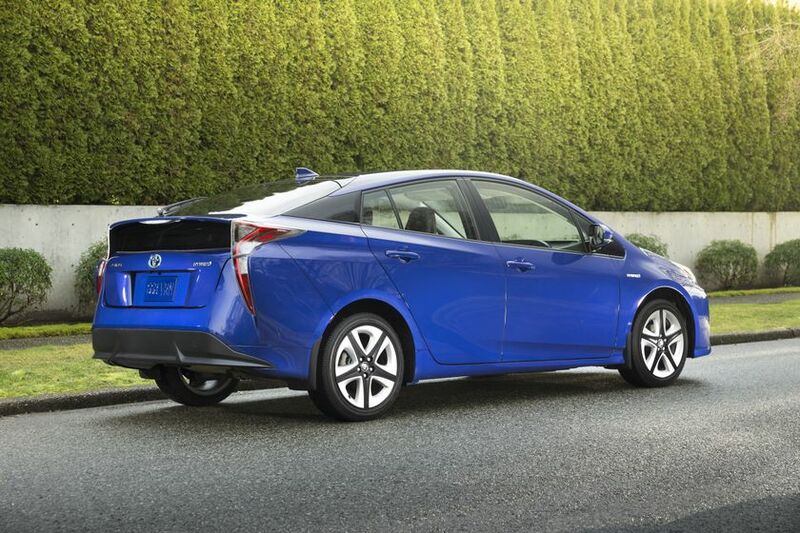 The 2016 Prius uses smaller, lighter hybrid components, including a newly available lithium-ion hybrid battery in addition to the existing nickel-metal hydride. 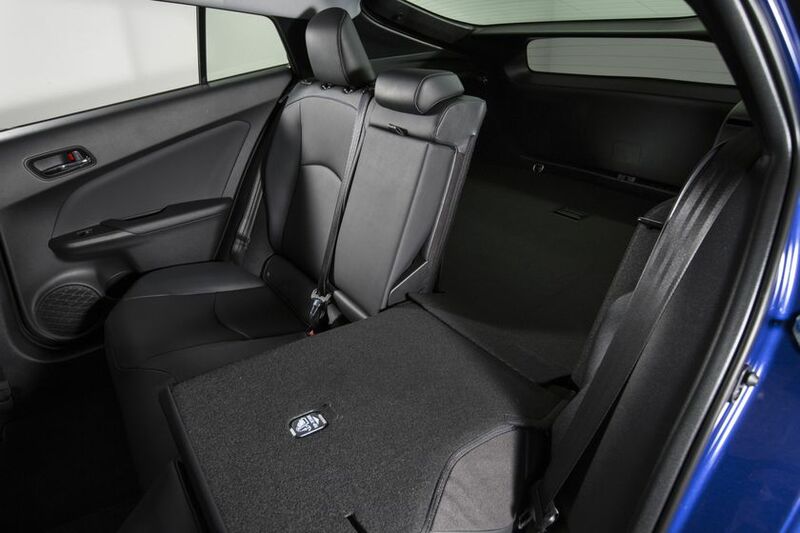 The new battery’s smaller size and flatter shape allow it to be packaged under the rear seat, rather than beneath the luggage area, yielding more cargo space. 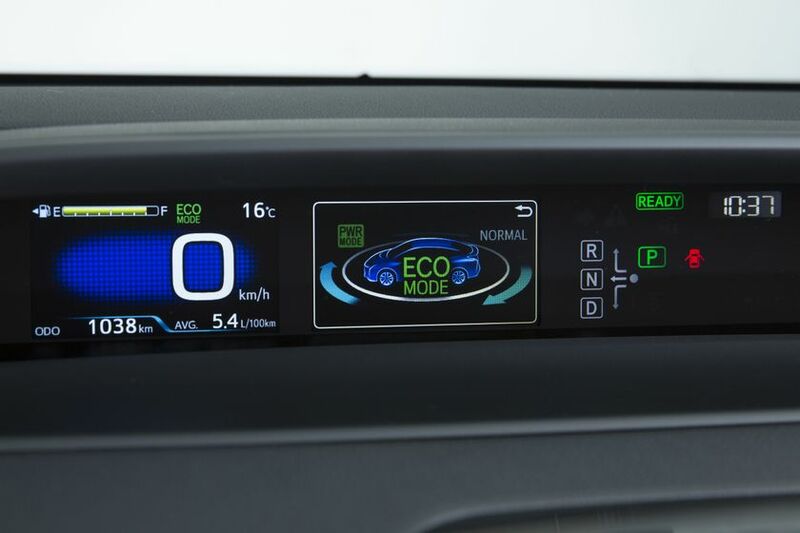 The new hybrid system operates more efficiently and more quietly and offers a higher level of driving performance than in the previous model. 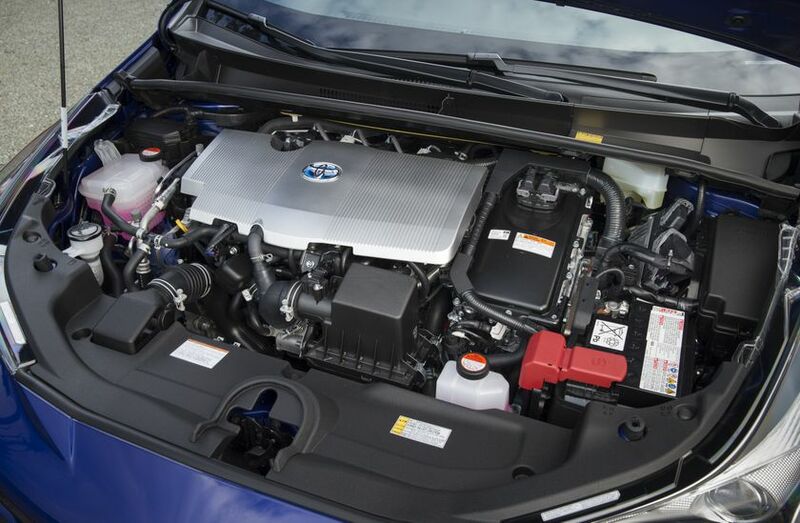 The smaller transaxle and power control unit allow for the auxiliary battery to be installed in the engine compartment. 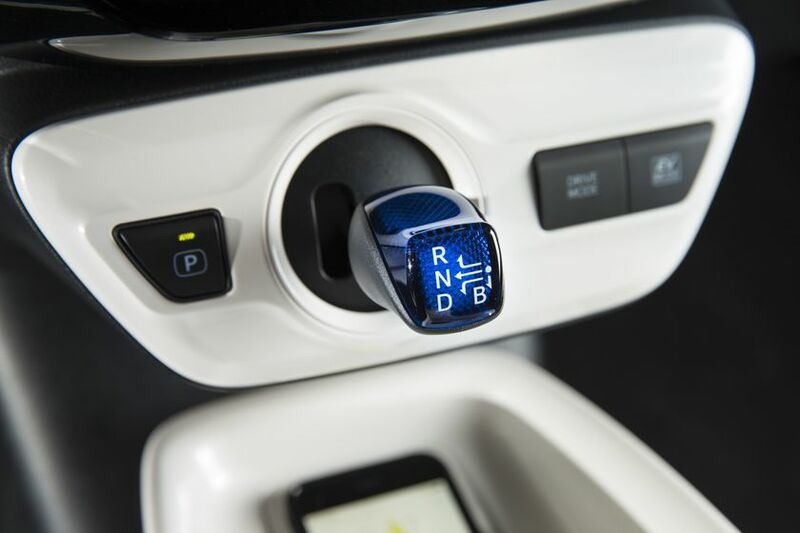 New shift-by-wire technology uses electric signals to transmit shift operations and offers light, fingertip operation from the dash-mounted shifter. 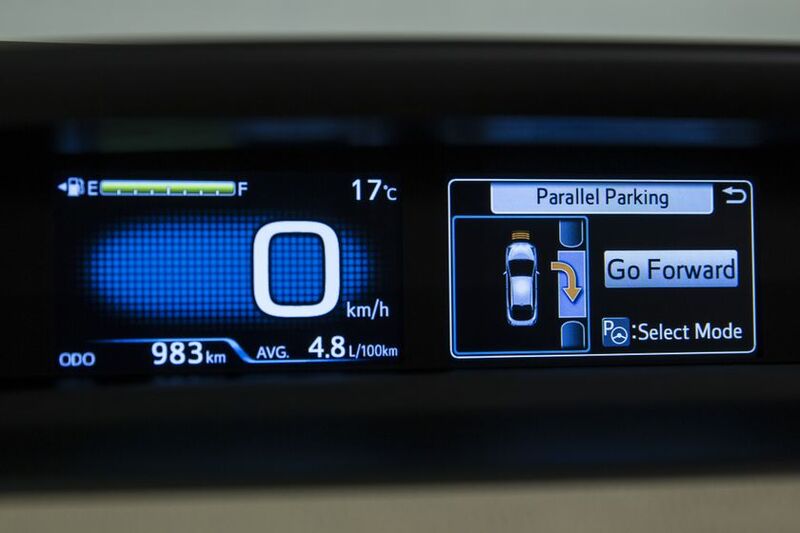 A “P” position switch provides one-touch engagement of the parking gear. 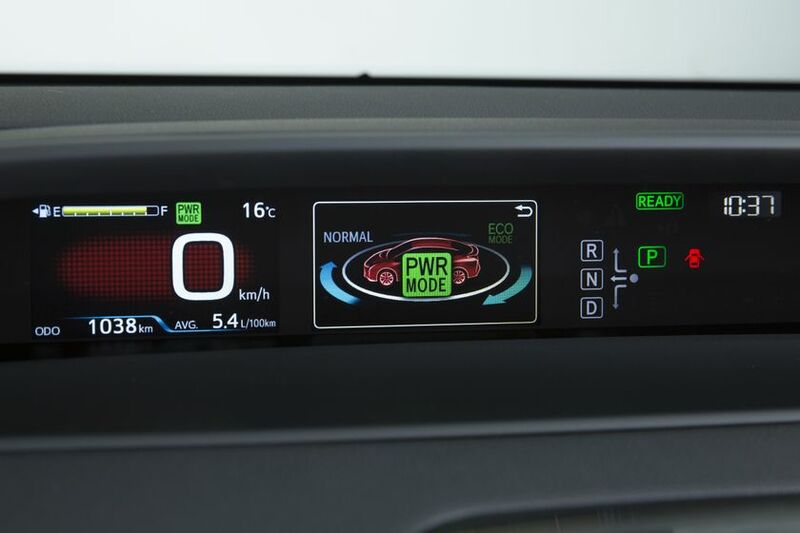 The Prius driver can choose between new selectable Normal and Power driving modes. 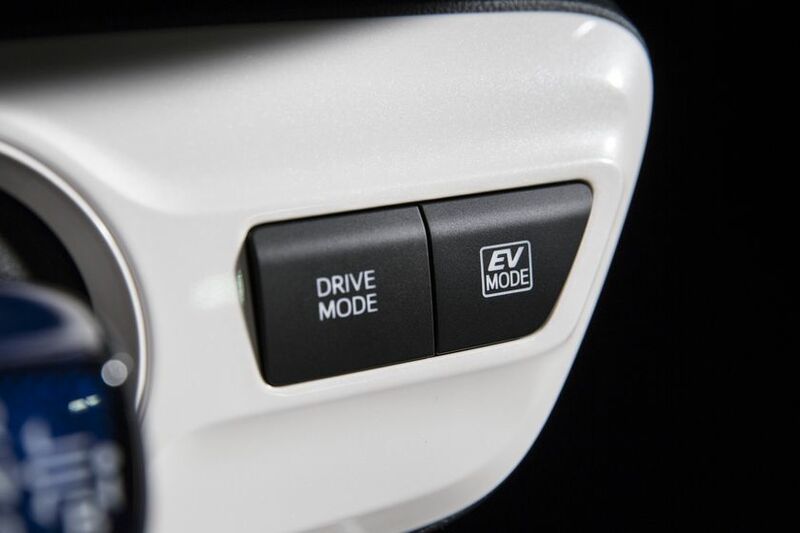 Normal balances both fuel economy and acceleration feel; Power prioritizes acceleration feel. 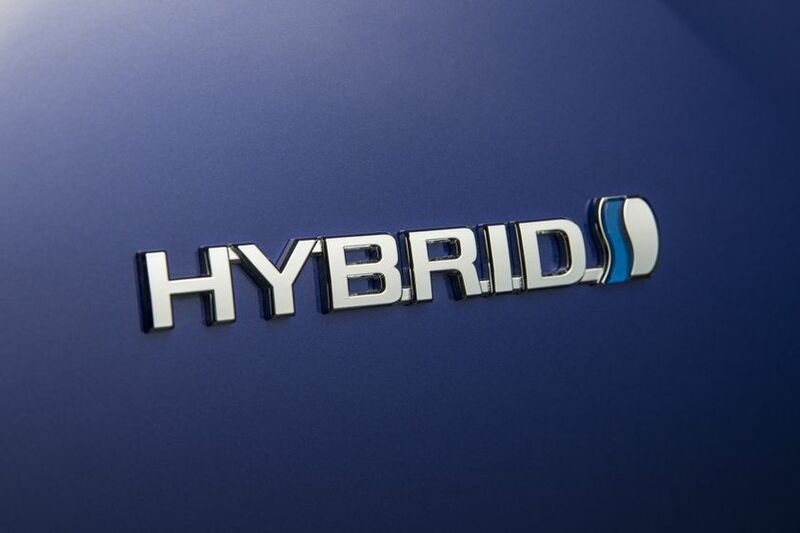 The new hybrid transaxle and motor use a multi-shaft layout with higher motor speed range and a reduction gear mounted on a parallel shaft to reduce parasitic losses by 20 percent compared to the previous model. 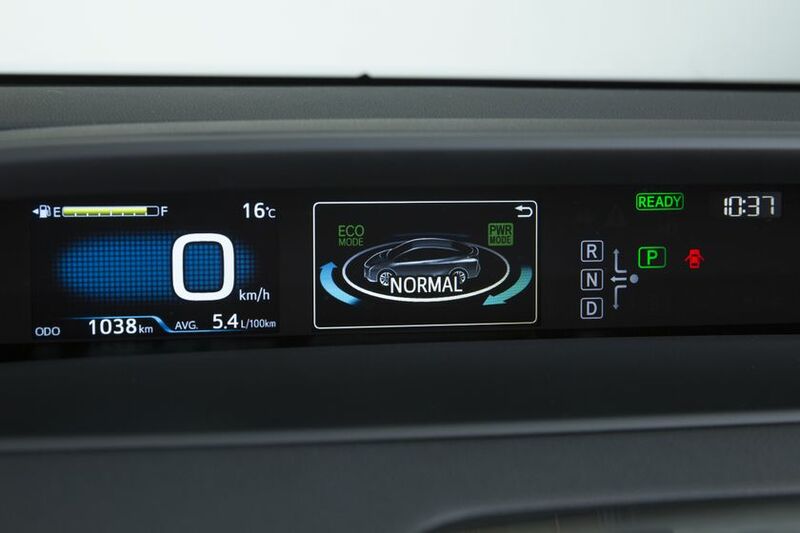 An enhanced DC-DC boost converter contributes to enhanced fuel economy by reducing output current in low-load situations. 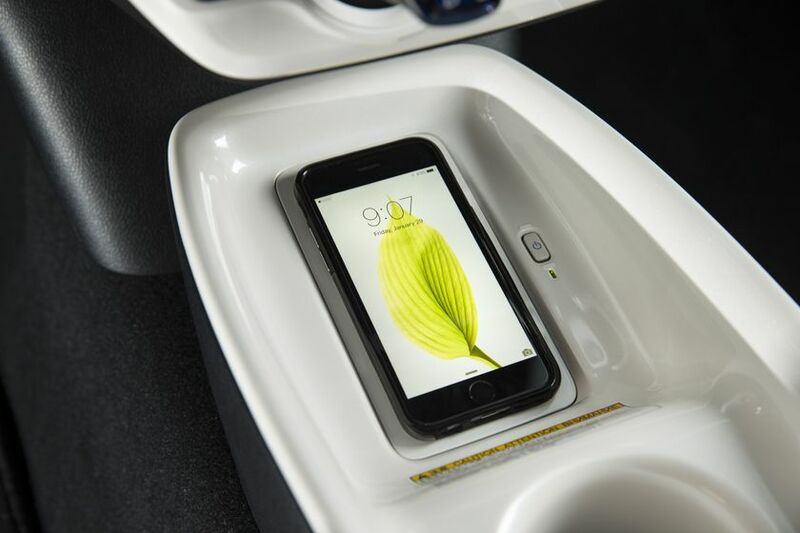 And it’s not only about the electric motors and batteries. 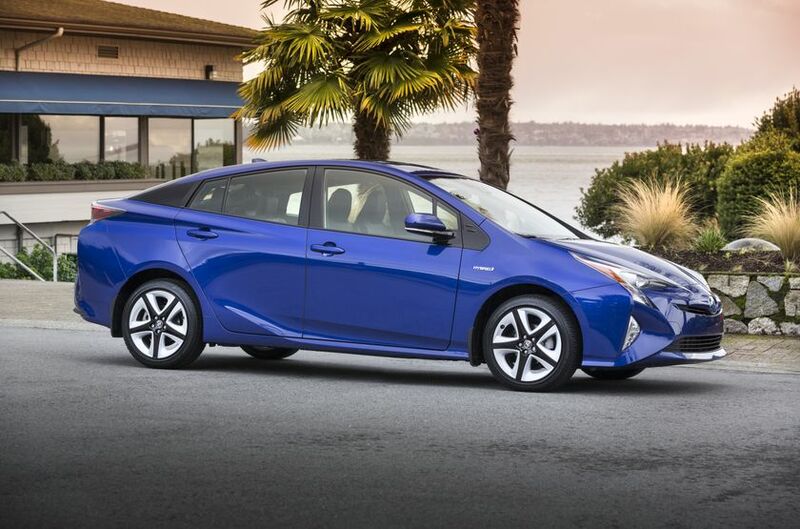 The retuned 2ZR-FXE 1.8-litre gasoline engine in the 2016 Prius achieves groundbreaking 40 percent-plus thermal efficiency, thanks to reduced friction of the rotating assembly and internal parts and improved combustion. 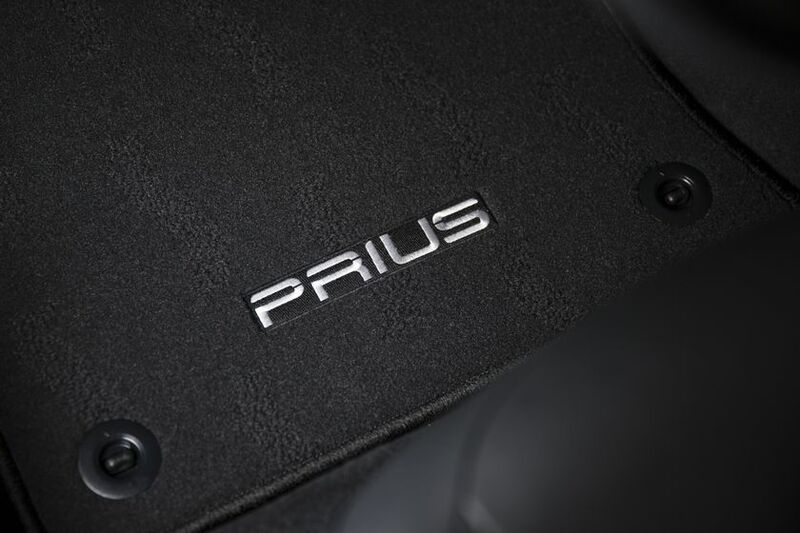 On top of that, both the intake and exhaust systems are quieter than before. 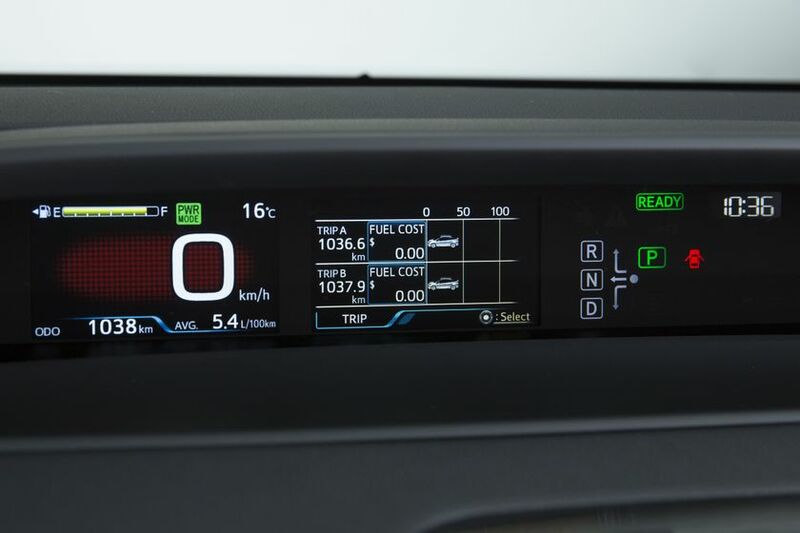 Among new feature is the Exhaust Gas Recirculation (EGR) system with a cooler, which operates even at the engine’s maximum output to enable an ideal stoichiometric air/fuel ratio across the entire powerband. 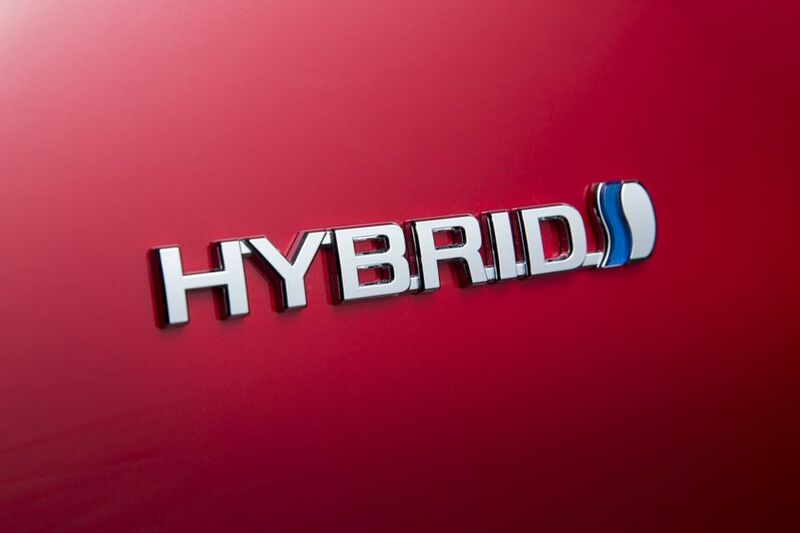 A smaller, lighter and quieter hybrid system water pump also does its part to reduce energy consumption. 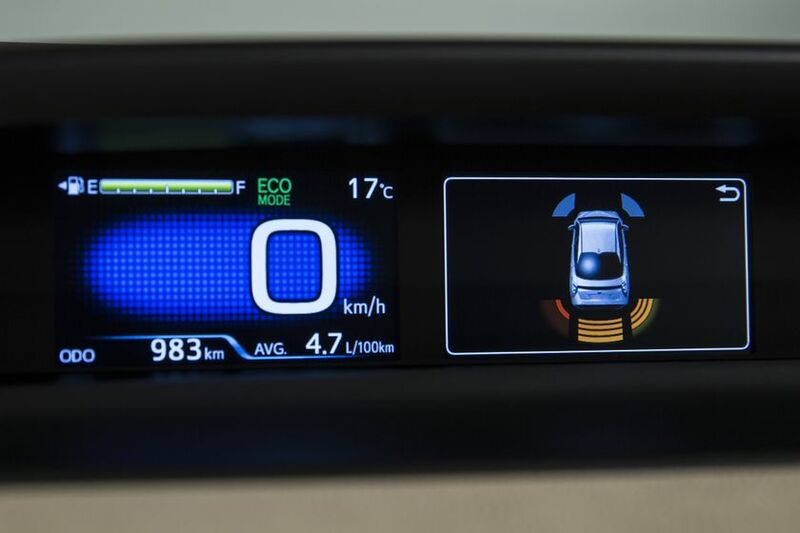 Getting the engine up to operating temperature quickly is critical to conserving fuel at start-up. 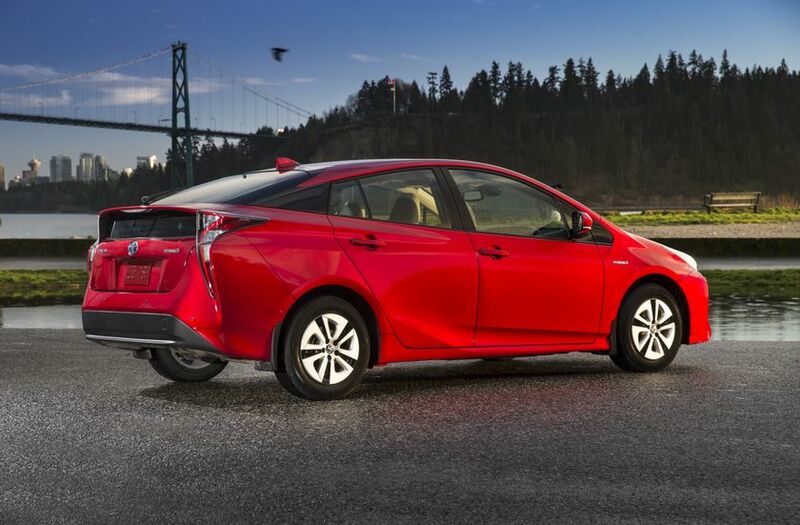 In the 2016 Prius, an exhaust heat recirculation system uses the heat of exhaust gases to speed engine coolant warm-up. 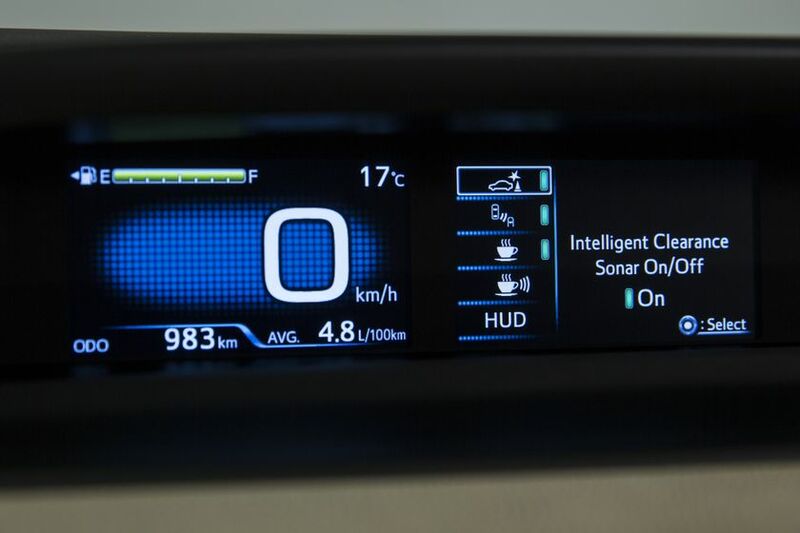 That in turn allows the hybrid system to stop the engine earlier and more often in the driving cycle when it’s not needed, for example in low-power-demand city driving conditions. 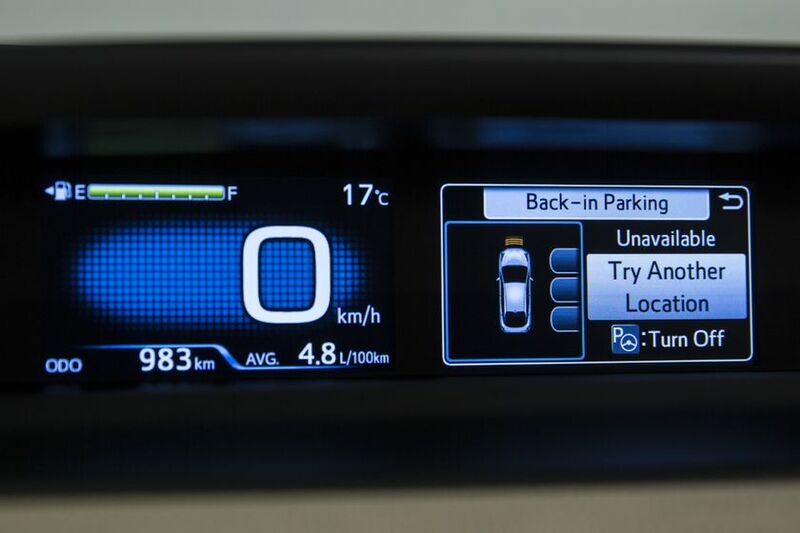 The 2016 Prius boasts a remarkable fuel efficiency of just 4.5L/100KM (city/highway combined), making it one of the most fuel efficient vehicles on Canadian roads. 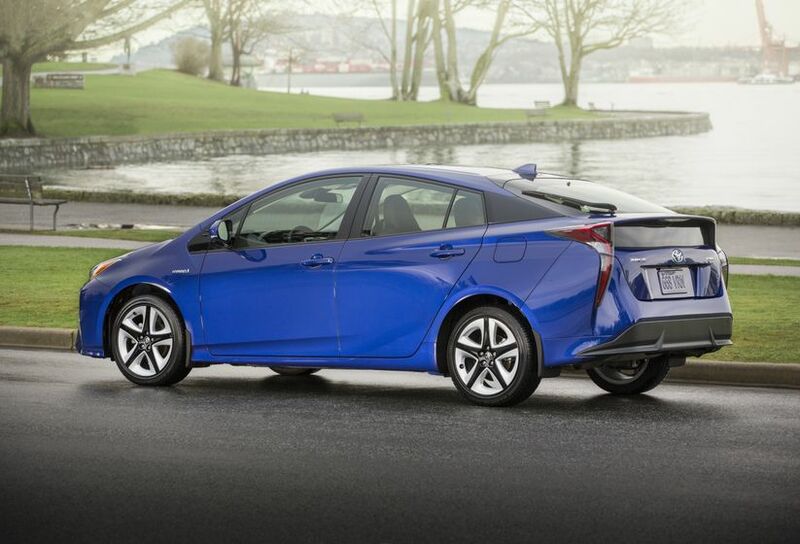 The “Triangle Silhouette” that defined the second and third-generation Prius models has been reimagined. 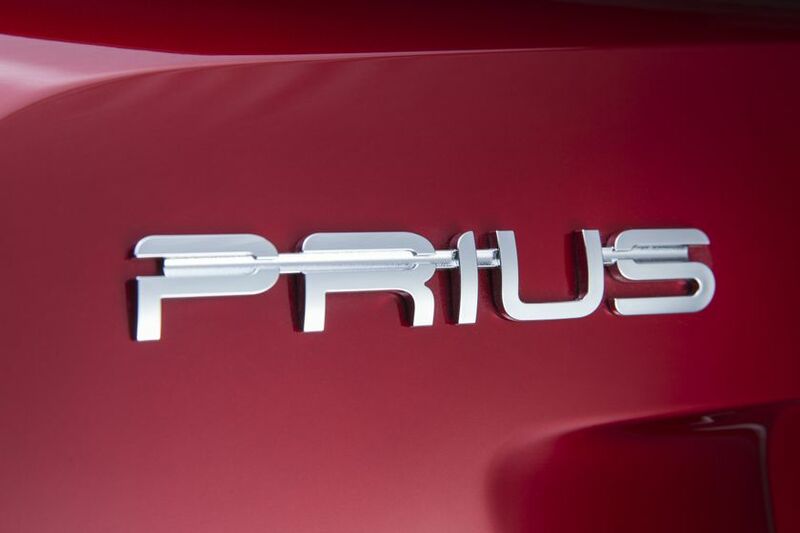 In profile, it is longer and sleeker with the overall outline evoking an athletic shape. 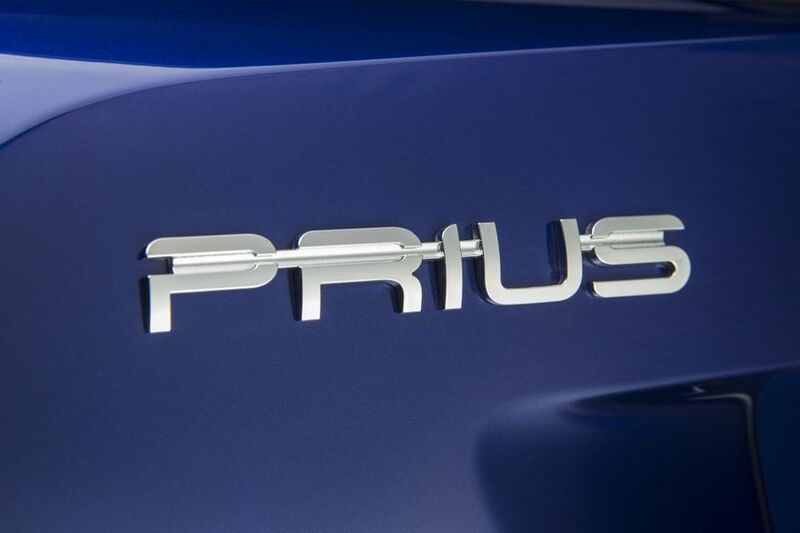 The hood is lower, and in fact the name badge on the front is at the same height as on the Scion FR-S sports car. 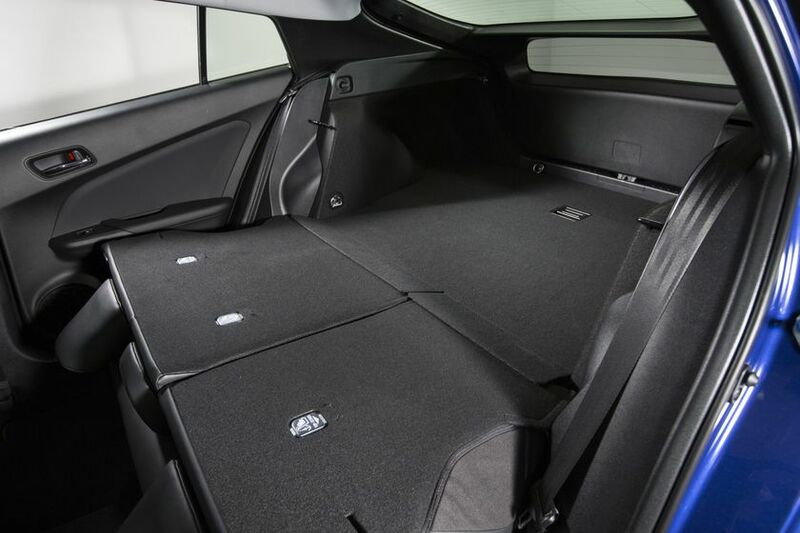 The distinctive roof peak has been moved forward by 170mm to further reduce drag while still ensuring ample rear-seat headroom. 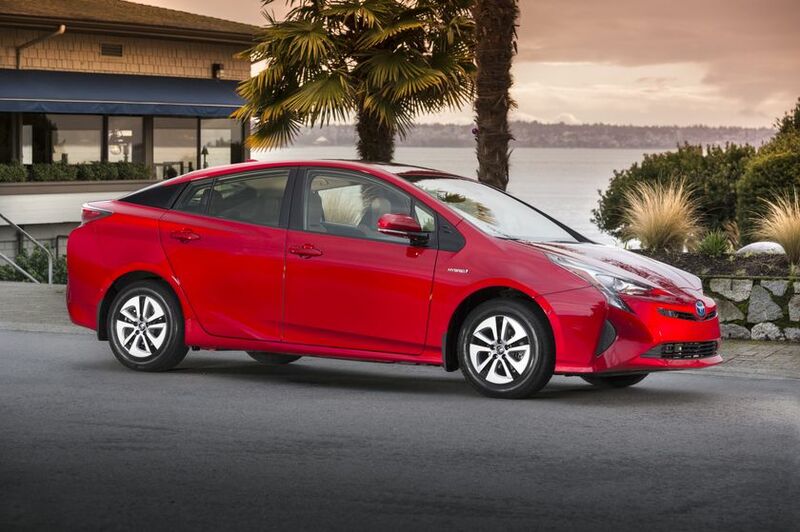 New standard Bi-LED headlamps dominate the Prius’ front fascia and give it an unforgettable face. 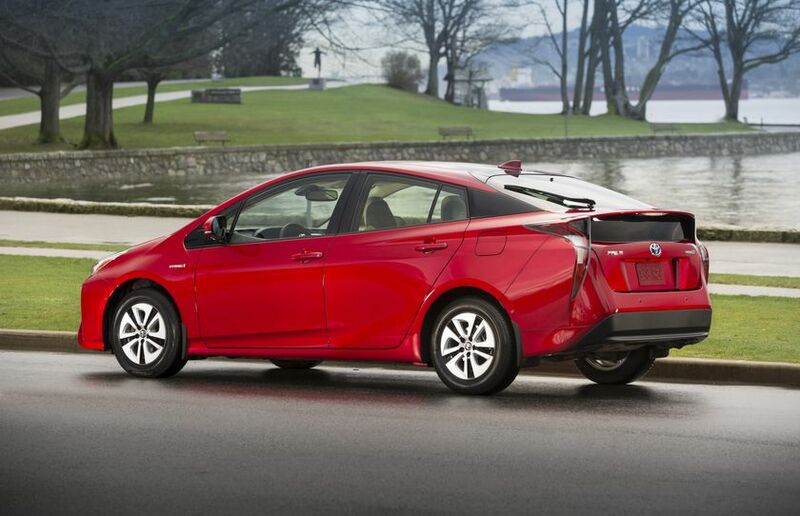 The unique and striking rear combination lamps express the distinctive lines of the Prius from the rear spoiler to the trailing edges of the sides and leave one of the most evocative nighttime signatures on the road today. 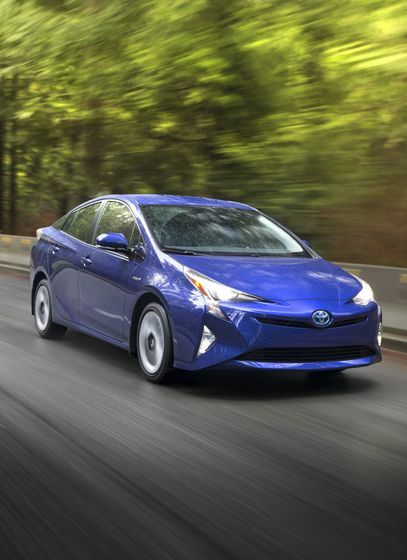 While turning heads, the new Prius design slices through the air with a 0.24 coefficient of drag (Cd), among the lowest of current production passenger cars. 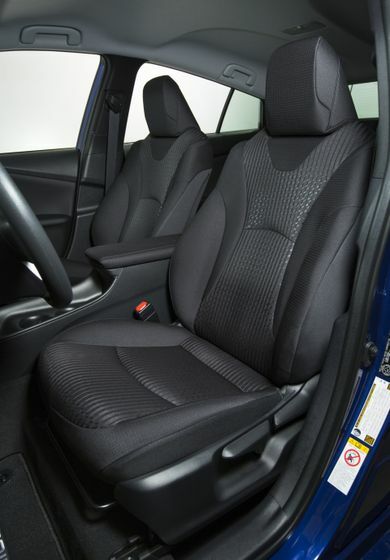 The sleek shape is aided by myriad details to keep the wind going on its way. 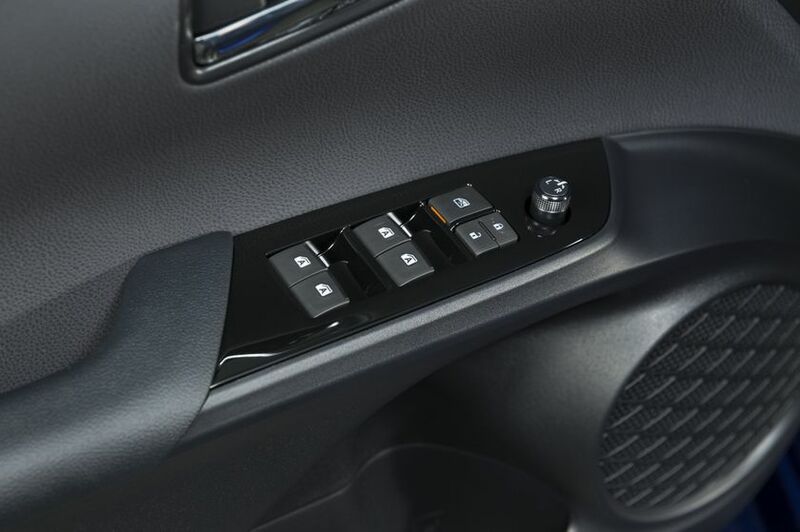 An automatic grille shutter reduces drag by closing when airflow to the radiator is not needed. It remains closed after a cold start to allow the engine to reach optimal operating temperature quickly, helping to save fuel. Aero stabilizing fins on the underfloor covers, front quarter window garnish and tail lamps likewise keep air moving in a smooth pattern. 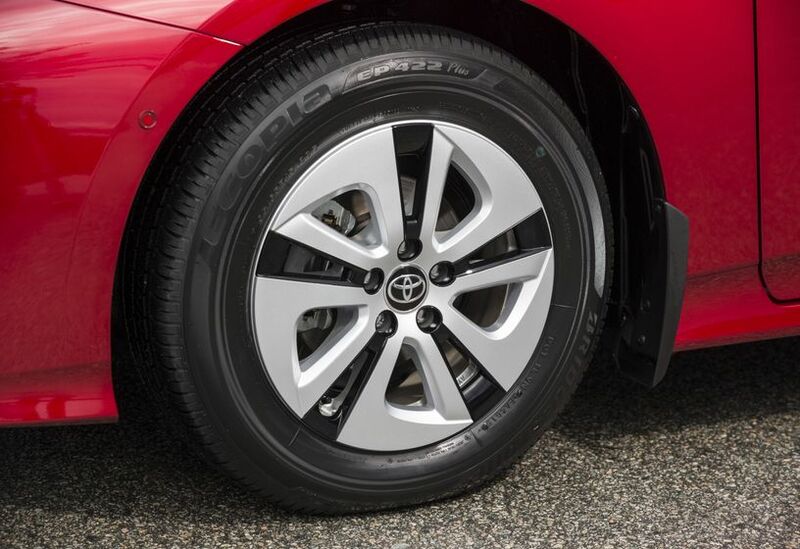 Front spats and covers on either side of the fuel tank help prevent airflow from being agitated by the tires and suspension. 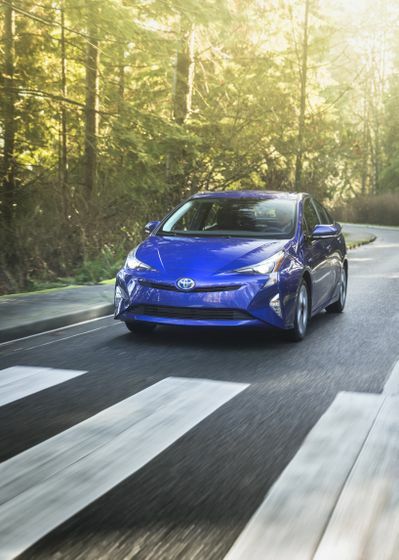 The new Prius is the first global vehicle to implement Toyota’s New Global Architecture (TNGA), an innovative and integrated approach to developing new platforms and powertrains for Toyota. 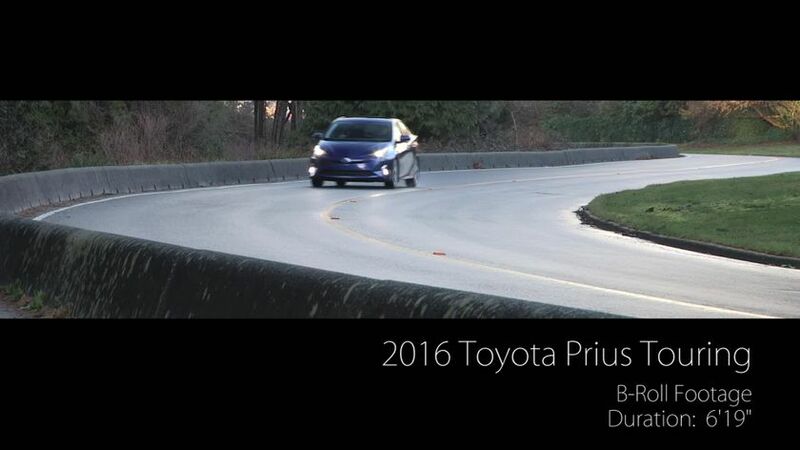 In the case of the 2016 Prius, the platform introduces a new high-strength body structure, new double-wishbone independent rear suspension and low center of gravity to yield a considerably more engaging driving experience while also providing a markedly smoother and quieter ride than the previous model. 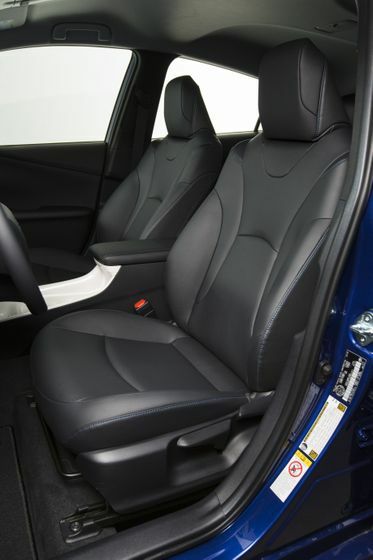 This integrated development program for powertrain components and vehicle platforms helps boost performance and enhance a vehicle’s appeal with drivers. 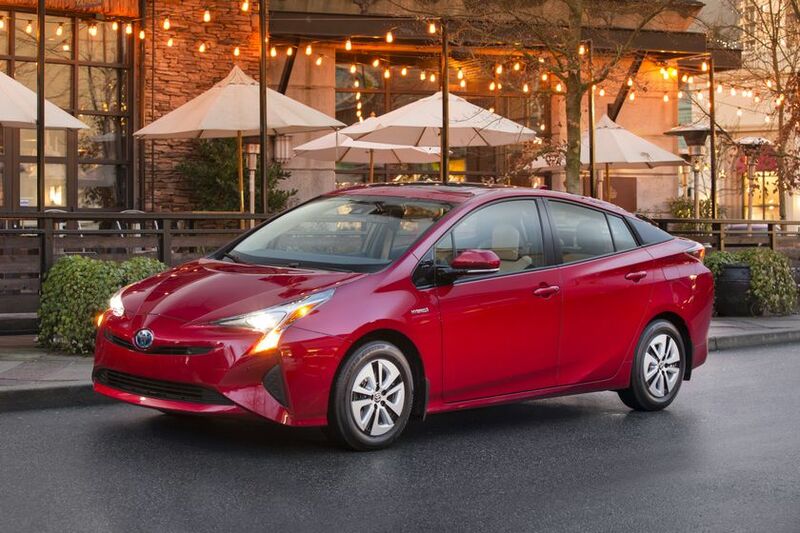 Curbside, the Prius has been completely reimagined for 2016, with a longer, sleeker, lower outline that conveys a more athletic, sporty design, and head-turning character lines and striking details. 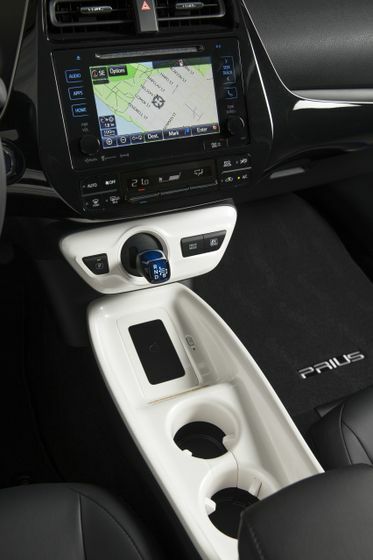 Inside, the 2016 Prius receives a beautiful, premium interior that combines advanced technology with features that combine function and fun. 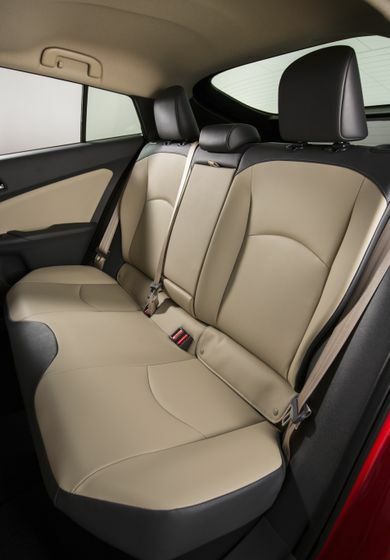 Comfort and space are also there for the taking. 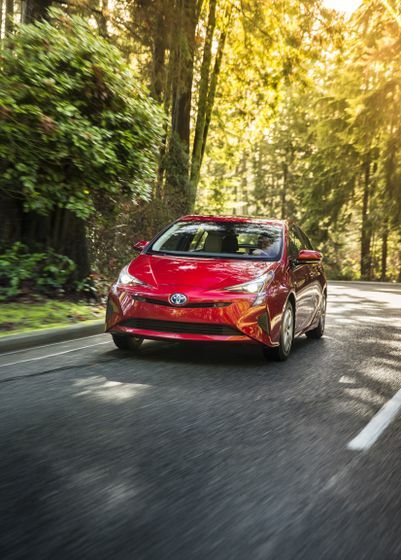 What the design promises, the engineering delivers: The new Prius is even more fun to drive thanks to a lower centre of gravity that makes the vehicle feel more firmly planted than ever before. 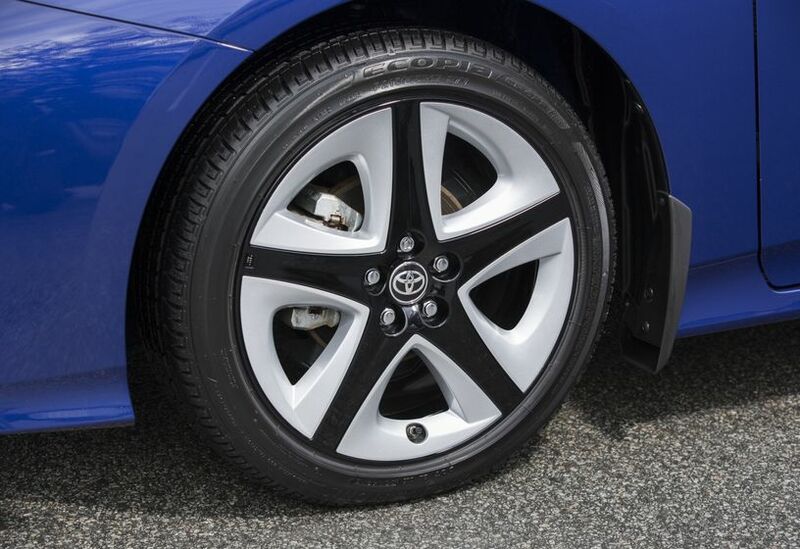 At the same time, a new suspension system – one of the benefits of TNGA – dials up driving pleasure. 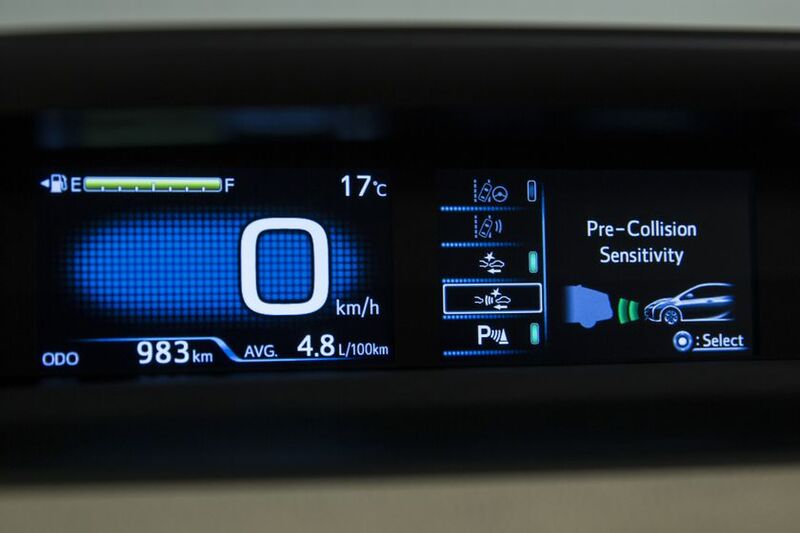 Building “Ever Better Cars” also means building ever safer cars – and the new 2016 Prius becomes one of the first vehicles in Canada to be offered with the available Toyota Safety Sense (TSS) system. 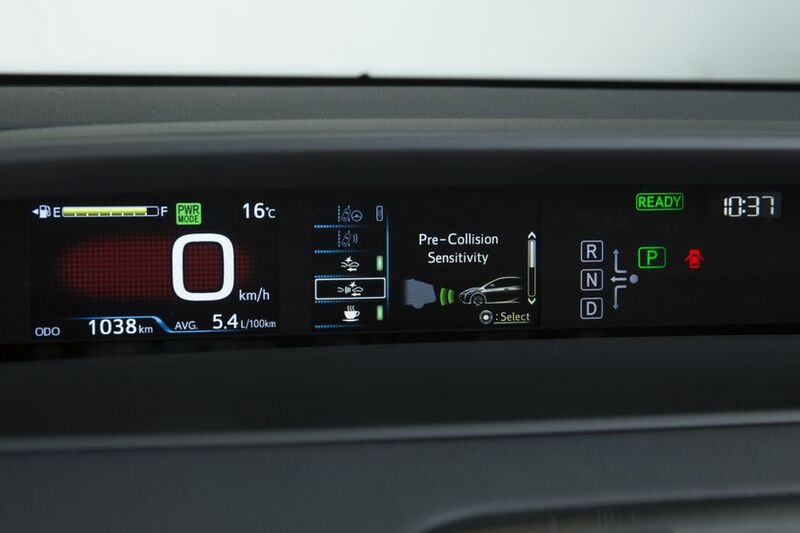 This new offering combines four advanced safety systems (Pre-Collision System with Pedestrian Detection, Lane Departure Alert with Steering Assist, Auto High Beam and Full-Speed Dynamic Radar Cruise Control working in stop and go traffic down to a full stop) into a single package. 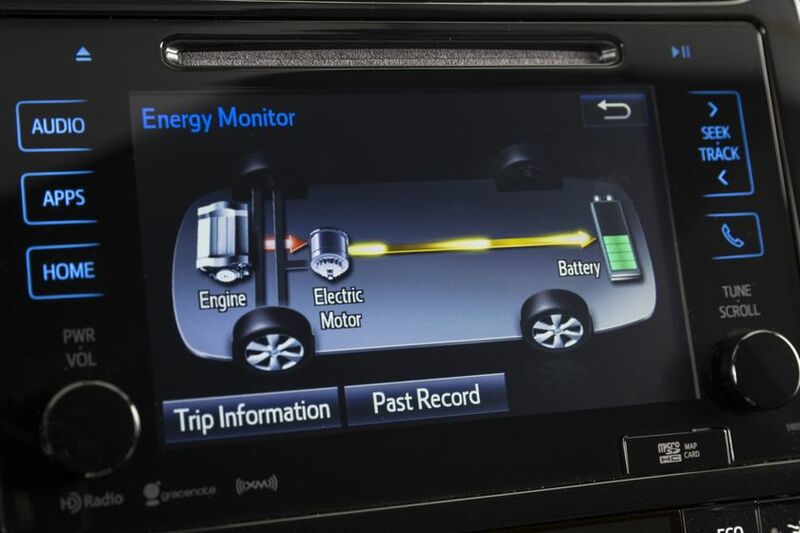 TSS will be standard on most Toyota vehicles by 2017. 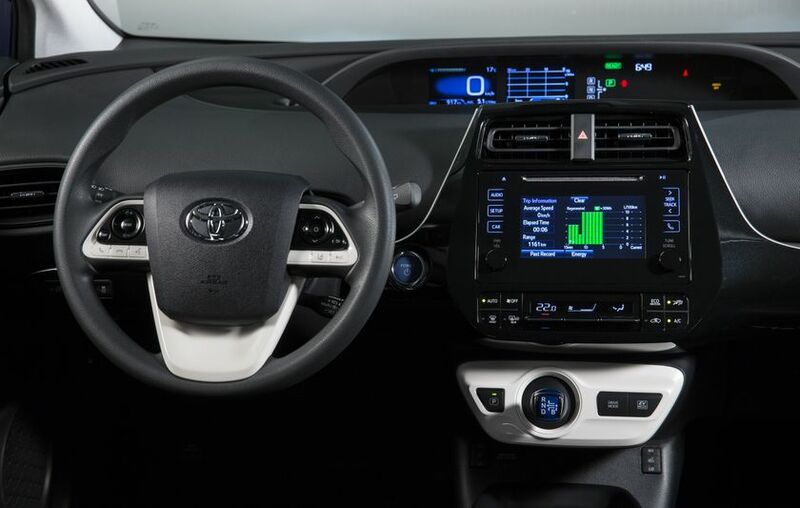 Other safety features include eight airbags, Active Front Headrests with Whiplash Protection, a Direct Tire Pressure Monitoring System, and the six technologies of the Toyota Star Safety System; Smart Stop Technology, Vehicle Stability Control, Antilock Braking System, Traction Control, Electronic Brake Force Distribution and Brake Assist. 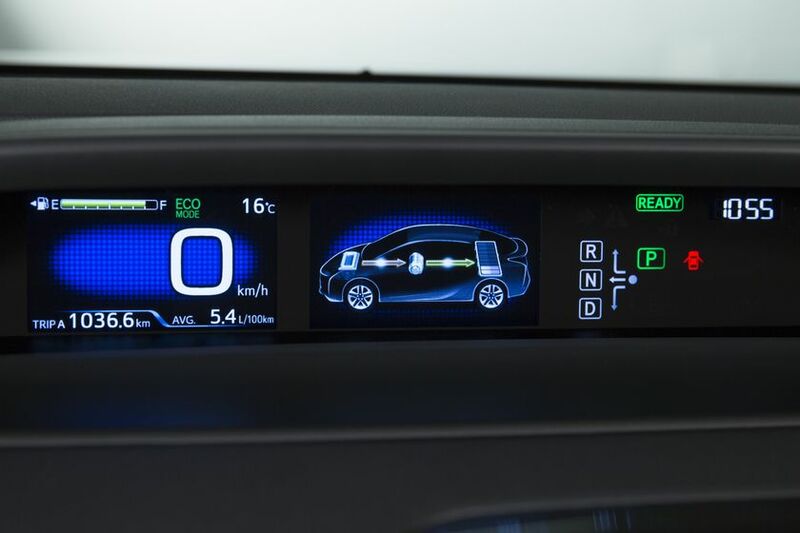 Because the Prius, under certain situations, can operate in battery mode alone, it incorporates a Vehicle Proximity Notification System to help alert pedestrians and cyclists. 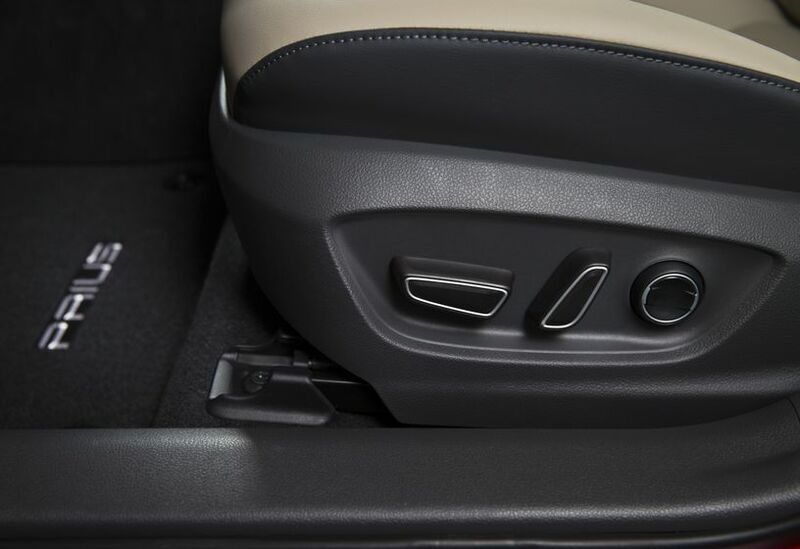 A small in-vehicle speaker emits a low but noticeable warning tone when traveling below approximately 15 mph, and the sound changes with vehicle speed. 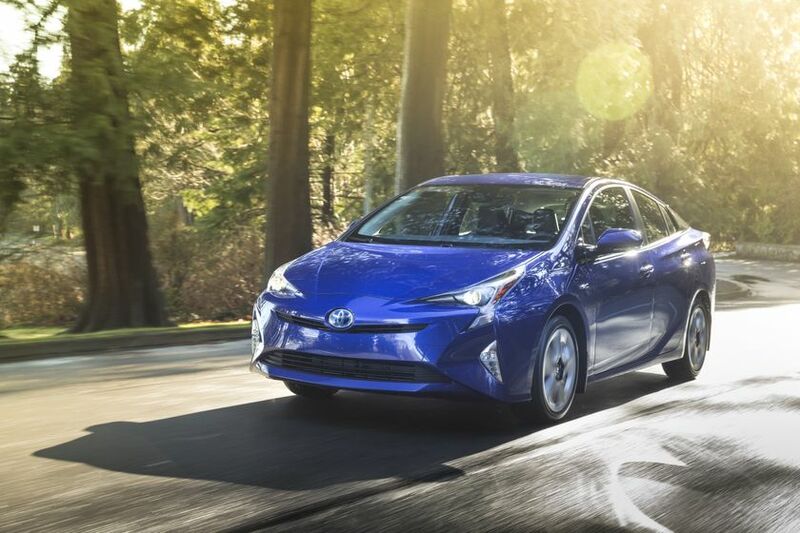 The 2016 Toyota Prius offers a new striking design, revised powertrain and improved efficiencies and standard features, yet it starts at a lower MSRP than the 2015 model it replaces. 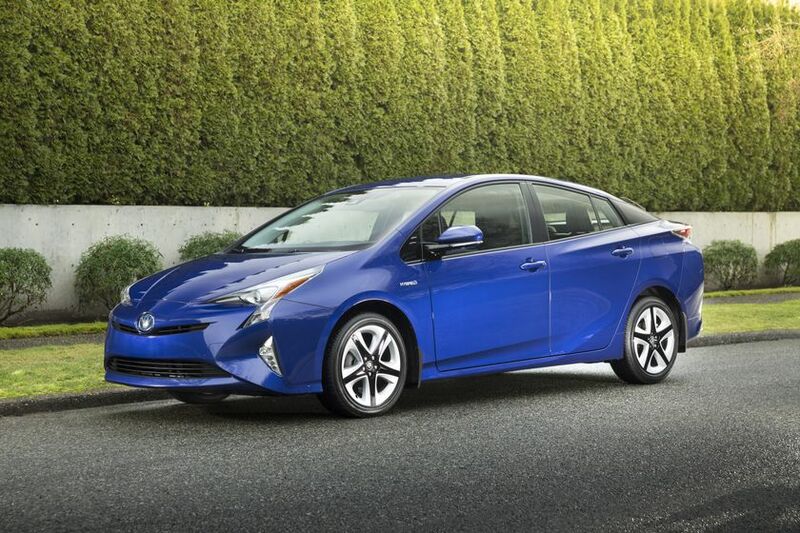 At a starting MSRP of $25,995, the all-new Prius is over $300 less than the 2015 base model. 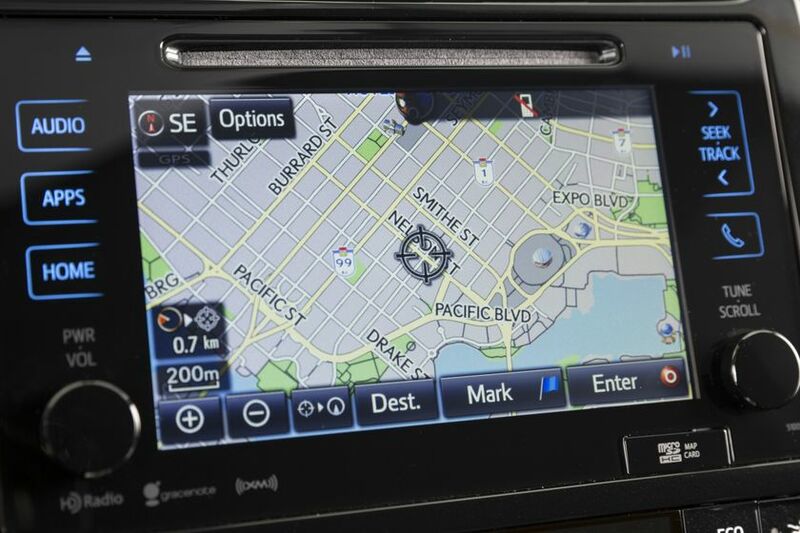 Standard features include a 6.1” Display Audio system with six speakers, voice recognition, Bluetooth capability, air conditioning with automatic temperature control, 60/40 split fold down rear seat providing plenty of versatile carrying capacity for up to five adults or loads of cargo, the Smart Key System and Push Button Start, a driver focused cabin divided into display and operation zones, featuring an eco-drive monitor, back up camera, multi-information display, and more. 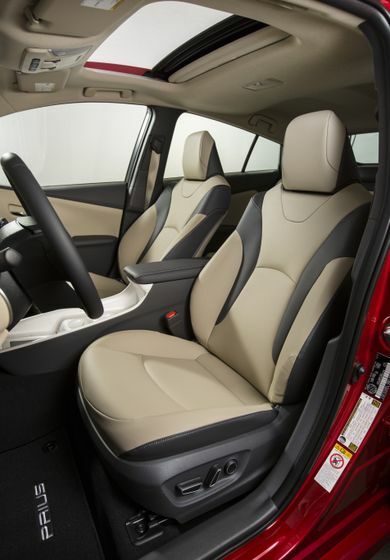 Plenty of thoughtful in-cabin storage, plus a 12V accessory power outlet, 15” aluminum alloy wheels with locks, power adjustable and heated exterior mirrors and LED tail lights, are also part of the impressive list of features. 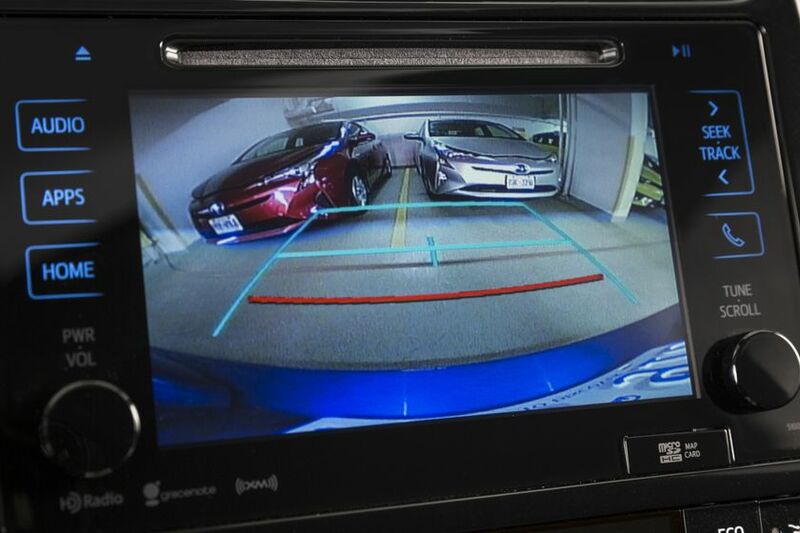 This model may be enhanced with an available Upgrade Package ($590), which adds the Toyota Safety Sense system and heated front seats. 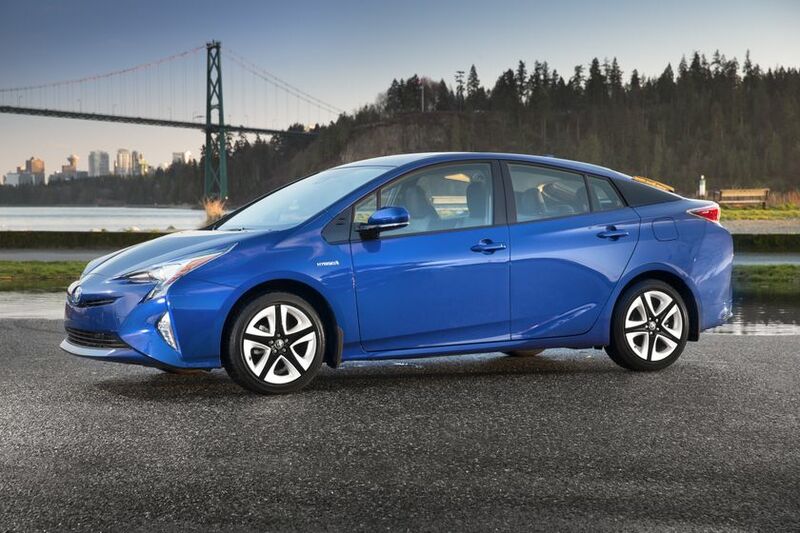 The 2016 Toyota Prius Touring features many style, comfort and technology upgrades as standard – creating a Prius with special appeal for those who like to hit the wide open road. 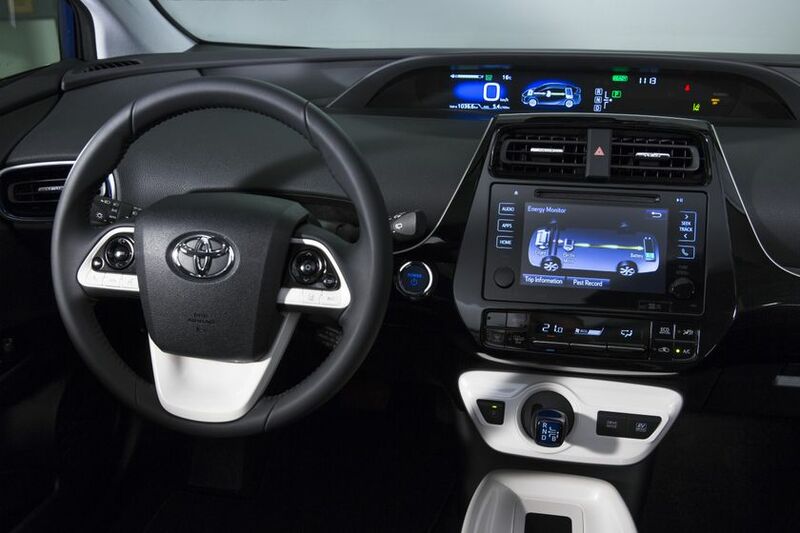 Standard features on this model include a wireless charging system for personal electronics, 7” Display Audio system with integrated XM Satellite Radio and Navigation systems, SofTex-clad seating and steering wheel, illuminated entry with step lamp, Toyota Safety Sense, unique 17” aluminum alloy wheels with locks, fog lamps, a touch sensor lock/unlock system for both front doors and the rear hatch, and more. 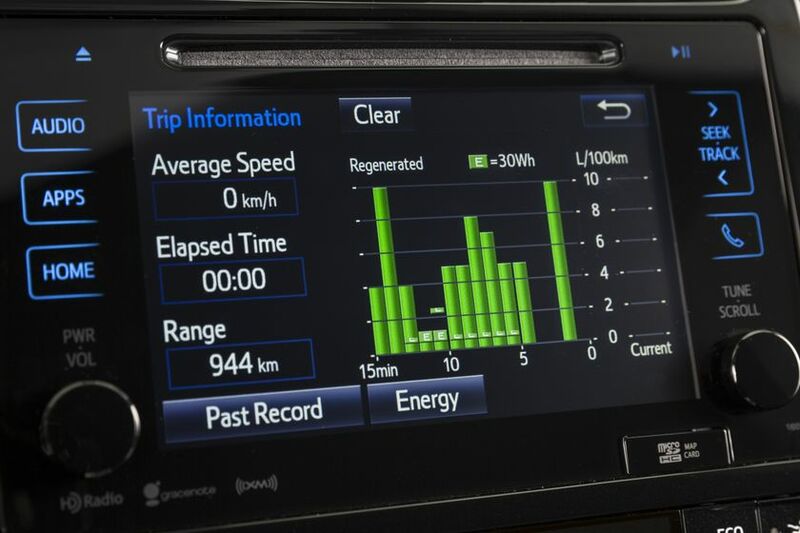 With major specifications similar to the standard model, the 2016 Toyota Prius Technology includes a mix of tech features that are popular with Canadian hybrid drivers. 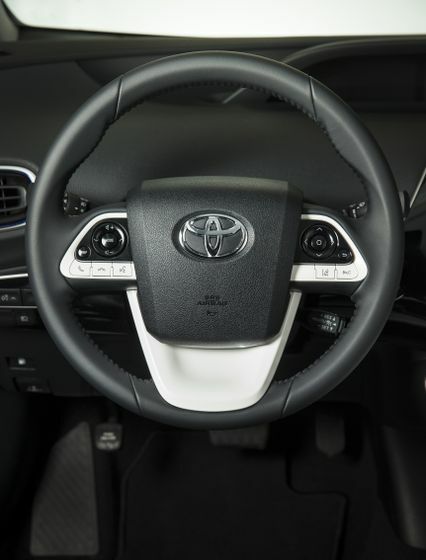 These include a wireless charging system for personal electronics, 7” Display Audio system with integrated XM Satellite Radio and Navigation systems, SofTex-clad steering wheel, illuminated entry with step lamp, Toyota Safety Sense, 15” aluminum alloy wheels with locks, a power tilt/slide moon roof, a touch sensor lock/unlock system for both front doors and the rear hatch, and more. 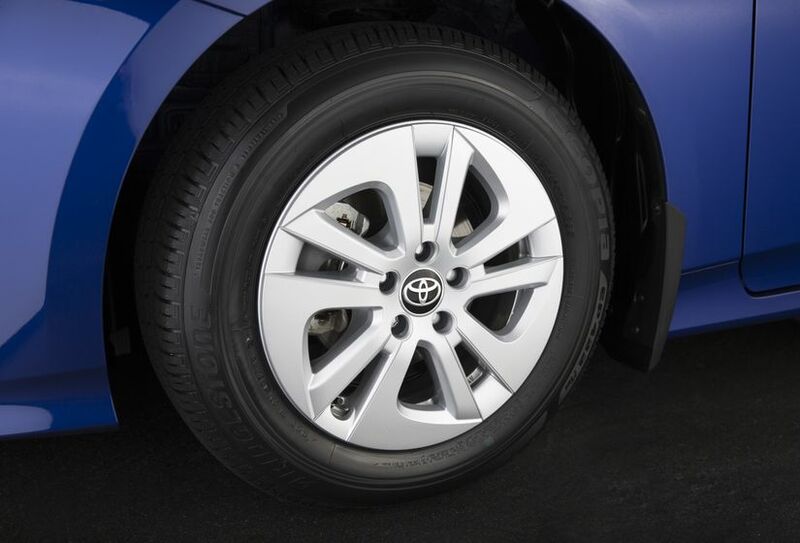 This model may be enhanced with an available Advanced Package ($3,260), which replaces the spare tire with a tire repair kit to provide additional cargo capacity. 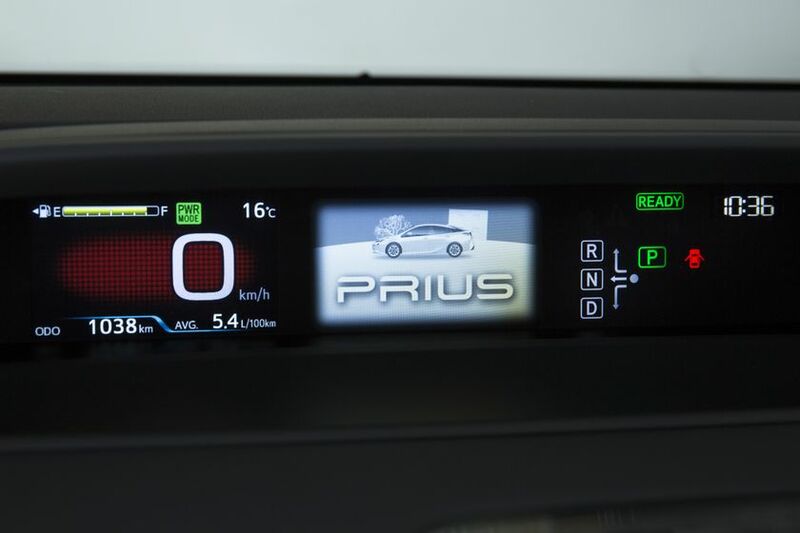 It also adds several systems that turn the Prius into a technology showcase, including the Blind Spot Monitor System with Rear Cross Traffic Alert, eight-way power adjustable driver’s seat, SofTex-clad seats, heated front seats, integrated garage door opener, easy-to-read head-up display, auto-dimming rear view mirror, rain sensing wipers, the Intelligent Clearance Sonar with Intelligent Parking Assist, and more.